On The Cover: On July 26 in Mohave, California, Scaled Composites and Virgin Galactic rolled out WhiteKnightTwo, the carrier plane for SpaceShipTwo. 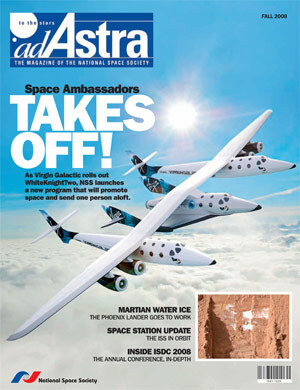 The cover illustration depicts the full configuration of WhiteKnightTwo, with SpaceShipTwo mounted below the wing in the center. As part of the National Space Society’s new Space Ambassadors program, one person will receive a complimentary ticket to ride aboard SpaceShipTwo. A new NSS program will bring space to the people, and send one person into space. As the International Space Station nears completion, our first permanent address in the stars is finally living up to its name. Built from the ashes of failed projects, the Mars Phoenix Lander continues to surprise scientists with new and unexpected results. The FAA associate administrator for Commercial Space Transportation talks about what it means to be an explorer in the 21st century. An overview of the NSS’s 2008 annual conference. Transcript of speech by Hugh Downs at the 2009 ISDC, where the legendary broadcaster was presented with a Lifetime Achievement Award. Individuals and groups honored for their dedication to the future of a spacefaring civilization. NSS presents the winners of the annual NSS-NASA Ames Space Settlement Design Contest. Coming to a calendar near you. NSS celebrates the 2009 Space Settlement Calendar contest winners.